Mercedes-Benz India has launched the much-awaited the 2017 E220d LWB in India at Rs 57.14 lakh (ex-Pune). This model joins the 2-litre petrol and 3-litre V6 diesel variants of the 2017 E-Class range in India. The E220d is powered by a 1,950cc diesel motor that produces 194PS at 3,800rpm and 400Nm between 1,600-2,800rpm. The engine is mated to a 9-speed transmission. E220d will slot in between the petrol and V6 diesel variants. The all-aluminium diesel motor in the E220d weighs 168kg, 31kg lighter than the previous diesel engine. It is also Mercedes-Benz's first sub 2-litre engine that's made in India, for India. 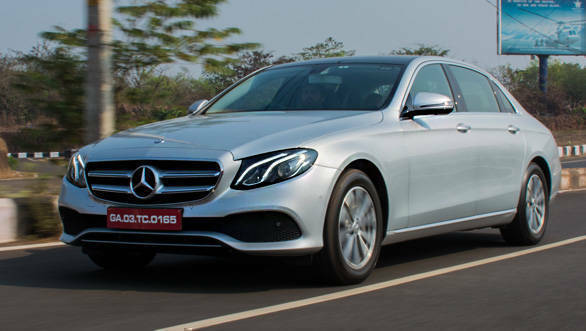 Despite being a mid-spec E-Class, the car will share features such as the 34-degree recline seats, sunroof and other creature comforts that are available in the other E-Class variants. The introduction of the E220d makes the E-Class a lot more accessible for customers who wanted a quick yet efficient diesel-powered luxury sedan, when compared to the V6 diesel E-Class. The E220d goes up against the Jaguar XF 2.0 diesel (Rs 61 lakh), Audi A6 35TDI (Rs 59 lakh) and the BMW 520d (Rs 55.28 lakh). All prices are ex-Pune.